If you are a veteran of the 315th Air Division, you are eligible and welcome to join the Troop Carrier/Tactical Airlift Association. Visit the web site at www.troopcarrier.org/home.html for details. 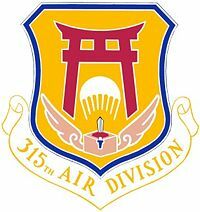 The 315th Air Division was formally established on February 1, 1951 as the Combat Cargo Division of the Far East Air Forces, with the primary mission of providing air transportation for United Nations forces fighting on the Korean Peninsula. Initially commanded by Brigadier General John R. Henebry, 315th operated C-47, C-46, C-54 and C-119 transports from bases in Japan on routes to airfields in Korea. The division controlled several troop carrier wings, including the 374th and 437th and the 314th Troop Carrier Group, which was on temporary duty in Japan from it's parent 314th Troop Carrier Wing at Smyrna, Tennessee. In 1953 two squadrons of the 374th Troop Carrier Wing at Tachikawa AB, Japan began equipping with the new four-engine Douglas C-124 Globemaster. The division also included the 6127th Air Terminal Group, an air transportation unit that operated air terminals at forward fields in Korea and throughout the Western Pacific. Combat Cargo Division transports operated in both the logistical and tactical roles, delivering cargo and personnel to airfields in Korea and airdropping supplies to ground units. The Division also conducted two major airborne operations with troops of the 187th Regimental Combat Team. Air evacuation of casualties was a major Combat Cargo mission, as wounded soldiers and Marines were airlifted to hospitals in Japan aboard returning transports. Pyschological warfare and covert operations was another 315th mission. When the Korean War ended with a truce, the 315th Air Division remained in Japan as the air transportation unit for the Western Pacific. The 374th Troop Carrier Wing remained at Tachikawa where it operated two squadrons of C-124s and another of C-54s and C-119s, while the 483rd Troop Carrier Wing was based at Ashiya, Japan with C-119s. Division aircraft operated into Indochina where the United States was supporting the French in their war against the communist Viet Minh. Several C-119s were provided to the French "on loan" from the US and were operated by American civilian crews employed by the CIA's airline, Civil Air Transport. A contingent of 483rd personnel operated in Indochina with the French. The 315th continued in both covert and overt air trasnporation operations in the Pacific in the mid-1950s. 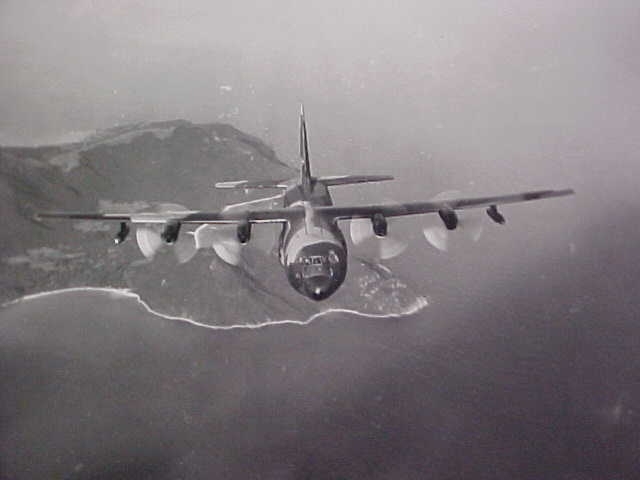 Covert operations were frequent, usually by C-119 crews, although other aircraft were also used in the covert role. In the late 1950s the Air Force began replacing the C-119s with the new four-engine turboprop C-130 Hercules. Two squadrons were assigned to the 483rd at Ashiya while the 21st Troop Carrier Squadron moved from Tachikawa to Naha AB, Okiniwa where it was primarily assigned to covert operations. In 1960 Ashiya closed and the 483rd Troop Carrier Wing was inactivated. One of its squadrons, the 815th TCS, transferred to Tachikawa while the 817th went to Naha to join the 21st. In 1963 the two Naha squadrons were joined by the 35th Troop Carrier Squadron which transferred to Okinawa from Sewart AFB, Tennessee. The three squadrons were assigned to the 6315th Operations Group. In 1964 hostilities in South Vietnam began escalating, and 315th strength was beefed up with Tacical Air Command C-130 rotational squadrons sent on temporary duty with Pacific Air Forces, to which 315th was now assigned. In late 1965 the Air Force transferred two full C-130 wings to the Pacific, the 463rd Troop Carrier Wing from Langley, Virginia and the 314th TCW from Sewart AFB, Tennessee - the 314th was made up of three squadrons from three different TAC bases. The 463rd was based in the Philippines, initially on Mactan Island near Cebu, then at Clark Field on Luzon. A fourth squadron joined the 6315th Operations Group at Naha; on August 1, 1966 the 374th Troop Carrier Wing was activated to replace the 6315th Ops Group. From 1964 on, the primary mission of the 315th Air Division was to provide C-130s for airlift missions in Southeast Asia. In 1965 Colonel Charles W. Howe, who had been with the division during the Korean War, returned to Japan to take command of 315th. Under his leadership, the division's airplanes, including C-123s that were based in South Vietnam, broke all existing airlift records and began achieving the reputation for which C-130s are now famous. The divisions C-130s and C-124s - one squadron remained at Tachikawa - airlifted personnel and cargo to Southeast Asia from Okinawa and the Philippines and also flew intratheater missions inside Southeast Asia. Beginning in June 1965, detachments of 315th AD C-130s were a regular part of the Vietnam War. In the latter part of 1967 the intensity of combat in South Vietnam intensified, and with it the increasing exposure of the C-130 force to hostile fire. Division C-130 crews were involved in some of the most heroic USAF actions of the Vietnam War, particularly the resupply of the Marine combat base at Khe Sanh, the aerial resupply of elements of the US Army's First Cavalry Division in the A Shau Valley and the airlift evacuation of the camp at Kham Duc. In 1968 the Air Force decided to inactivate the 315th Air Division due to the increasing role of the jet transports of the Military Airlift Command and the presence of a new airlift division at Tan Son Nhut Air Base in Vietnam. The 315th was inactivated on April 1, 1969 - its units transferred to the numbered Air Force in whose area they were based.